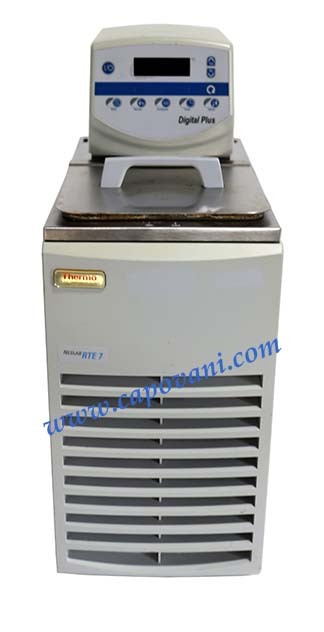 In addition to this Neslab RTE-7 Digital Plus , Capovani Brothers Inc stocks a wide range of used heating and cooling equipment, including used bath/circulators. Typical manufacturers include Fisher Scientific, Haake, Hart Scientific, Lauda-Brinkmann, and Neslab. This used bath/circulator and all the other used and refurbished semiconductor, scientific, and laboratory equipment listed on this website are owned by Capovani Brothers Inc. and stored at our facility in Scotia, NY. Accessories RS232/485, Analog Output Connector, 1/8" Nitrogen Purge, Timer, Temperature offset, Optional Extermal Sensor Connector.